I’m absolutely thrilled to be able to tell you that I have been awarded an Asialink Arts Residency in Tokyo! This means that I have been given a grant to go and work on my art for two whole months (later this year) at the Youkobo Artspace in Tokyo. Last week I was in Melbourne meeting with the staff from Asialink and many of the others artists, including writers, visual artists and curators who will also be travelling and working across Asia in 2016. It was great to meet the other artists and find out what they will be doing and also to hear from previous grant recipients about their experiences. It’s very exciting and at the same time just a bit daunting to be part of this program. In addition to Asialink, the arts residency program is supported by the Australia Council for the Arts and also in my case by Arts ACT. You can read the Arts ACT press release here. A full list of the 2016 residents can be found here. By special request for Mo Crow, here are two crow prints, recently unearthed when my friend came over to help me sort out the disaster area otherwise known as my back bedroom (thanks M). Both of these are mordant prints on recycled fabric, dyed with plant dyes. I’m assuming eucalypts of some sort but it was a while ago. This is quite a pale print and I’m thinking that the fabric may be rayon, rather than cotton or linen which seem to work much better with this process. This chap was printed onto fine linen and has come up much darker than the previous sample. These pieces are still waiting to find their purpose in my work, but in the meantime I’m happy to just admire them. A quick trip to the National Gallery yesterday to see the small exhibition Black – more of that another time perhaps. En route passed this unidentified Indian goddess in the Asian gallery. Today I was back to play at the cafe again with my magic pencils and the odd bit of white chalk. This past weekend I visited the National Museum of Australia to see the exhibition Encounters: Revealing Stories of Aboriginal and Torres Strait Islander Objects from the British Museum. The exhibition also provides links to contemporary Aboriginal people and communities via a series of videos that give the visitor an insight into their view of these items. But is an exhibition that is based on a paradox. That is that many of the objects on display were taken (read stolen), without permission from individuals or communities. Yet these objects would almost certainly have not survived this long, due to the perishable nature of their construction, had they not been taken. In several of the videos I watched, people commented on how they had gained both practical knowledge and cultural strength from interacting with these objects. Before I tie myself into a total knot about my feelings about how many objects in this exhibition were ‘collected’ I’d better show you some of the items I drew. First up is a stone kodj, or axe from King George Sound, Albany in Western Australia, collected by Alexander Collie sometime between 1831-33. This kodj was one of the tools used for butchering animals. Two large stone flakes have been hafted onto a wooden handle with resin (not sure what type, but possibly from a grass tree). The sharpened end was also used in the butchering process. The strange yellowish shapes I noticed on the handle turned out to be collection labels. A more complex construction was that of a necklace made of swamp wallaby teeth, which was collected some ten years later on the eastern side of the continent. The root of each tooth was bound by fine string to a leather strap. The teeth are in excellent condition and appear quite white, with almost a blue or violet tint, hence the water colours I added when I got home. I also made two drawings of a Dangal, or dugong charm used for bringing good luck while on the hunt (well not to the dugong anyway). When I looked closely at this charm I could see what appears to be red ochre on it’s muzzle and also in a stripe along its back. The handle made of twine goes around the head and tail and a fine piece of twine is also threaded through the body of the animal via a small drilled out tube. This is such a refined a piece of work. Per usual there’s so much more I wanted to draw, but there was more in store. Out the exit and into the next room is a second exhibition called Unsettled. This room showcases five contemporary Aboriginal artist’s response to the Encounters exhibition. I thought that this was one of the best small group shows I’ve seen in quite some time. The work of Jonathan Jones is featured in a window that opens out into the main foyer. His work, Unitled (fort), reflects on a wooden fort built by surveyor and explorer Major Thomas Mitchell and his party of 21 men on 27 May 1835 . The stockade was built to protect against possible attacks by the local Kurnu Paakantji people. Fort Bourke was never attacked and no longer exists but Jones believes it remains a marker of still unresolved frontier relationships. I was also really impressed by the video work of Torres Strait Islander dancer/artist Elma Kris and the contemporary take on traditional burial poles by Yolŋu artist Wukun Wanambi. I would highly recommend both exhibitions. On at the National Museum of Australia, until 28 March 2016. Entry to both exhibitions is free. 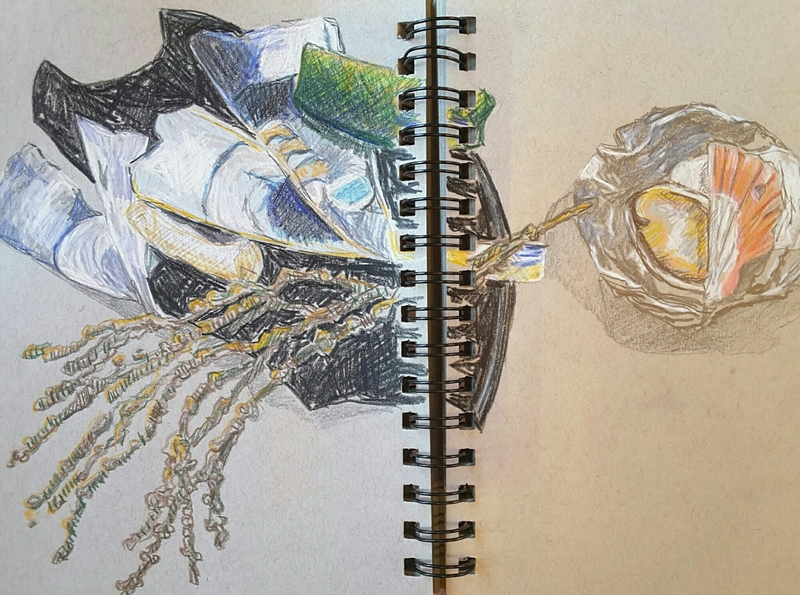 I’ve been using my Koh-i-noor Magic Pencils as my main sketching material for a few weeks now. Apart from being caught up in the sheer fun of multicoloured pencils that would be the envy of any pencil case, I find that they are ‘magic’ in other ways as well. They are ‘magic’ because you can’t quite control where the colour will turn up. They are ‘magic’ because they encourage me to play. They are ‘magic’ because they remind me to focus on the structure of my drawing – where is the light coming from? – not what colour is her t-shirt? They are ‘magic’ because paying attention to the key elements of a subject is more important than ‘completing’ the picture. They are ‘magic’ because they show me that drawing can be much so much more interesting than straightforward representation. We couldn’t resist a return to the beach. 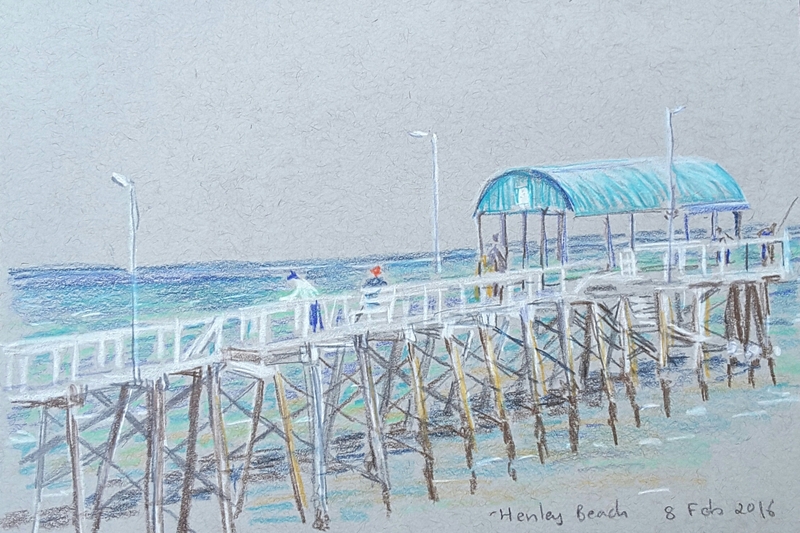 This time we moved a bit further north along the shore and stopped to draw the jetty at Henley Beach. We sat on the edge of Henley Square, part of the redevelopment of the beachfront carried out by Taylor, Cullity, Lethlean (whose work is familiar to me closer to home at the National Arboretum in Canberra) and Troppo Architects. 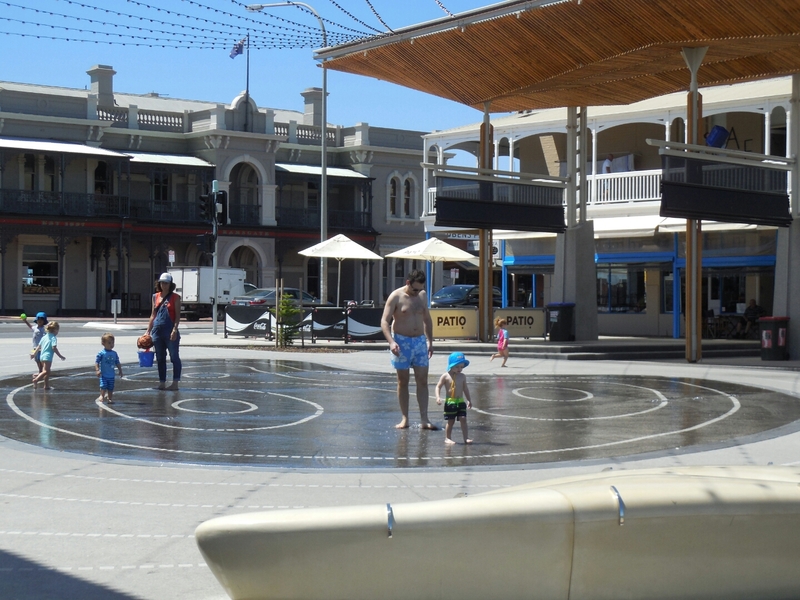 Part of Henley Square with the children’s water play area and shade ‘wing’ in the background. What attracted me to draw the jetty was the blue shelter canopy at the end. The colours blended so beautifully with those of the sky and the sea. I can see a lot of technical errors in this drawing, but at least I’m satisfied with the colour. 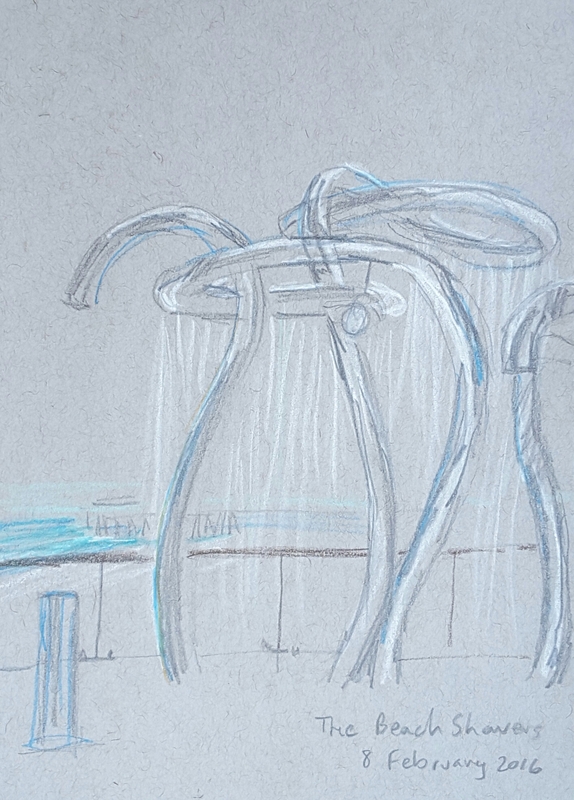 When I turned to my right I could see the beach showers, which are sculptures in their own right. I haven’t been able to find out the name of the person who designed thes, but that doesn’t detract from their interestingly functional design. As is often the case I’m much happier with this sketch than the one of the jetty that I laboured over! It’s rather embarrassing but I have just found this post from early February 2016 which I forgot to post, so somewhat belatedly, here it is. I love visiting the city of Adelaide and a trip to the Art Gallery of South Australia is always on the ‘to do’ list. On this visit I wanted to see The Power of Pattern: the Ayako Mitsui Collection, which highlights kimonos and the stencils and techniques used to decorate fabric. 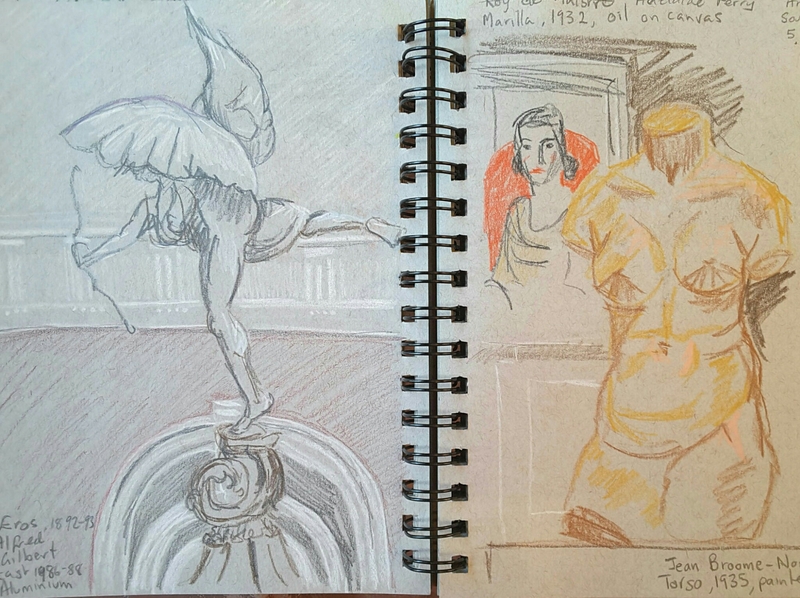 While there I also took the time to do some drawings of some of the sculpture in the main gallery. After a bit of culture it’s also good to catch a bit of nature, in the form of one of Adelaides beaches. Saturday was near perfect beach-going weather with a clear sky and very little breeze. The water was crystal clear over a white sand bottom so visibility was excellent. After quite a bit of decadently floating around, my nephew and I started looking at the various things we could spot underwater. Apart from ‘the usual suspects’, seaweed and razor clam shells, we found a big chunk of smoothed bottle glass and somewhat unexpectedly a large piece of an old LP record. The latter had also clearly been in the water for quite some time so I couldn’t say exactly what music had been entertaining old Neptune.